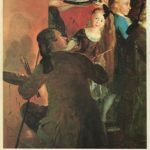 Blog sobre Francisco de Goya. Espacio de amistad que aglutine a todos aquellos amigos de Goya o de lo que representa Goya, a la manera de un club on line. There are several links that we can establish between the genius of Fuendetodos and the bimillenary city of martyrs. 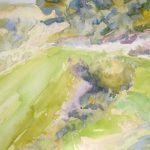 Some of them are clearly contrasted by the reality of his work, while others, pending of corroboration, remain in the air as simple hypothesis or half-hearted speculations. Etching recorded with number #20 from series of engravings of La Tauromaquia (The Bullfighting) is the image that best demonstrates the link between Goya and Calahorra. It is titled Ligereza y atrevimiento de Juanito Apiñani en la de Madrid (Lightness and daring of Juanito Apiñani in Madrid’s) and represents one of the most famous stages of the time: the hop pole, whose protagonist is a contemporary calagurritano (from Calahorra) of the Aragonese painter. Juan Apiñani, born in Calahorra, was a bullfighter on mid-18th century, banderillero in the team of José Romero and Martincho, and according to the Spanish illustrated erudite José de Vargas Ponce in his work written in 1807, ‘Dissertation on bullfighting’, had a brother, Manuel aka ‘The one-eyed’, who was bullfighter; also called the Tuertillo or the Navarrito, as stated by José María de Cossío in his famous treatise Los Toros (The Bulls), he was the head of the bullfighting team to whose commands, as well as Juan, were their other three brothers, the banderilleros Emeterio, Gaspar and Pascual. They formed the largest bullfighting family of their time and as team frequented the area of Navarre and Aragon. Pamplona and Zaragoza, which bullring was inaugurated in 1764, were scenes of their deeds, as well as Madrid, where Juan already did bullfighting in the Court since 1750 according to Nicolás Fernández de Moratín. Its renowned value and valuable skill, his ease and agility in cuts and jumps were the most distinctive features of his worth bullfighter and qualities that gave him fame in his time. Bullfights in Madrid around mid-century; appears in Pamplona in 1752, where does a bullfighting the following years. In 1764 premieres in Plaza de Zaragoza, in which bullfights main runs until 1770 except on year 1767. There is no certainty that the protagonist of the engraving was a matador. However, Néstor Luján in La Tauromaquia: collection of the different stages and attitudes of the art of dealing toros (bulls) invented and recorded by Francisco de Goya y Lucientes, refers to the success and popularity that had as bullfighter Juan Apiñani on foot and as banderillero between 1764 and 1770. He was, even, one of the best-paid matadores at the time. Vargas Ponce quotes an accounting settlement of 1769 which reads: “For jumping the bull, Apiñani, 240 reales (old Spanish coin of 25 cents of peseta)”. Which is perhaps the most popular image of La Tauromaquia belongs to that group of prints featuring the matadores and most unique bullfighting figures of the era, which includes the most varied stages, duels and distracting manoeuvres of the moment. Unlike that first group of engravings offering a historical view of the Fiesta and that Goya developed as illustrations from the text of Nicolás Fernández de Moratín, La carta histórica sobre el origen y progresos de las fiestas de toros en España (The historic chart on the origin and progresses of the Festival of Bulls in Spain), the etching of Apiñani is integrated into that second group of prints engraved from the memories of his youth, because we know that it was witnessed by the painter himself in his youth years. The Aragonese painter’s like for bullfighting is written in letters to his friend Martín Zapater, ending usually signed with the popular nickname of ‘Don Francisco, the one of the bulls’. He even showed off, at the end of his life in French exile of Bordeaux, of having done bullfighting in his youth; that we know from another of his friends, Leandro Fernández de Moratín, who reflected it with these words: “Goya says that has bullfighting in his time and that, with the sword in hand, no one fears. He is doing eighty years old”. Let’s think of the talent that is passionate about the bulls for the Aragonese genius. Look him attend and witness with his eyes the beauty and the tragedy of what happened in the Spanish arenas; passes and death blows, scenes, various events. And do not forget the famous “I saw it” that underlies the work of the mature Goya and that as a leitmotif beats in every one of his masterpieces. 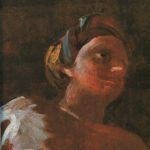 These visionary representations, the evoked scenes, remembered events are seen things; experiences that Goya returns to us, experiences which, in its significance as art, throw some images of penetrating emotion and intense visual force. In the case of the image that represents the calagurritano bullfighter, Goya implemented lucid visual memory ability to record the scene. If Juan Apiñani was bullfighting around 1750 in Madrid as Moratín says, and was active in the long five years from the last third of the 18th century which mentions Luján and Vargas Ponce extends up to 1775, it is impossible that during the etching (1814-1816), the bullfighter of Calahorra continue jumping the bull, that said with words that Goya used to name the scene, because we know that the original title was this: Saltar el toro con palo (Jump the bull with stick). Lafuente Ferrari, in La Tauromaquia, says that on the notes given by Goya, very brief when titling its scenes, Ceán Bermúdez specified the names. In fact it is the Asturian illustrated who identified the protagonist and the place of the death blow Goya represents with this extensive and detailed statement: Ligereza y atrevimiento de Juanito Apiñani, alias el de Calahorra, también en la de Madrid (Llightness and daring of Juanito Apiñani, aka The one from Calahorra, also in Madrid’s). The critical fortune of which this work possesses has been dilated over time. In 1917, the Spanish painter and art critic Aureliano de Beruete, in his book Goya grabador (Goya engraver), refers to the print of the jump of the pole as one of the most beautiful etchings of the series and with a supreme originality. 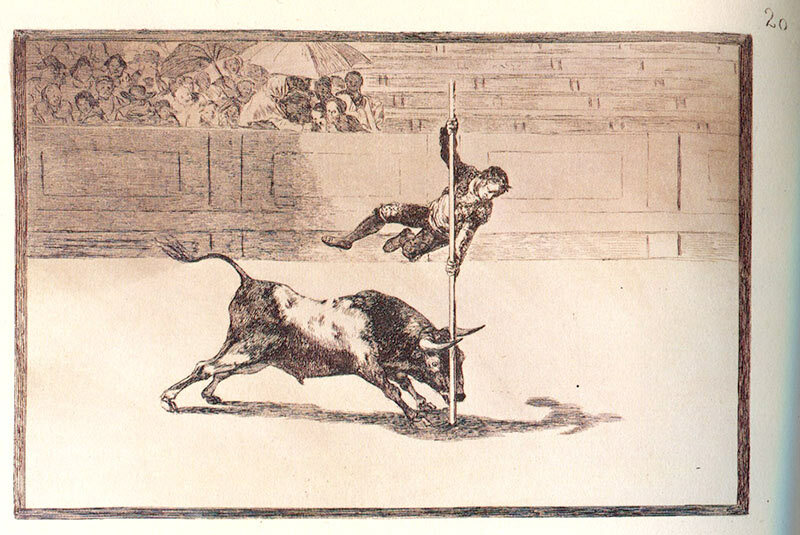 In the middle of last century, the essayist and Spanish erudite José María de Cossío, advised by the Spanish art historian Enrique Lafuente Ferrari, in the second volume of Los Toros considered the Apiñani’s as the most beautiful and bright etching of bullfighting series, and one of the master prints of Goya’s production. Other authoritative voices in the topic as the historian of Spanish art, who was Director of the Prado Museum between 1983 and 1991, Alfonso E. Pérez Sánchez, says that the print based on the stage that the calagurritano bullfighter runs is the most beautiful, and the intellectual and art historian Julián Gállego defines it as one of the more gracious and delightful of his graphic work. Parallel to this print made with the technique of etching and aquatint on a white laid paper, there is a drawing to the sanguine that Goya conceived as preparatory study. On ivory laid paper, there are appreciated slight traces of a second red pencil in addition to the dominant sanguine. The measures are somewhat smaller in the case of the engraving; 245 x 353mm has it of footprint, this drawing decreases to 186 x 278mm. The Prado Museum has dated it at the same time (1814-1816) and given the same title. The differences between one and another work, slightly visible in the representation of its iconographic elements, are more noticeable in the expression of its formal aspects. The subtle variations in the definition of details and background, changing the disposition of viewers, are insignificant in comparison to the considerable transformation of the approach, significantly further away from the observer, but radically more concise in their reading, and the intensity of the contrasts in the masses of tonal values, highlighted with much higher order and rigor in the case of the print. 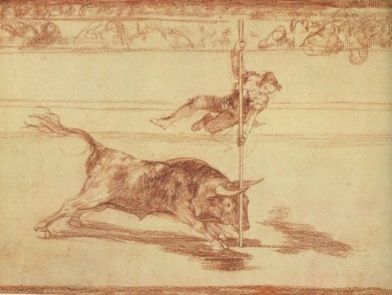 It’s surprising the verticality of the pole which, targeted on the albero (sand) in the centre of the unified shadow of the beast and man, seems to symbolize the gravity and exercise of referee balance between opposite diagonals: the ascending lightness in subtle foreshortening of the bullfighter and the determined shaking down onslaught of the bull. All the visual tension is concentrated at that point in the sand where the calagurritano thrust the pole and at the same time pointed the elongated shadow as a third character in action, the figure blurred and disproportionate of someone who, at one time, dance and wobbles. Perhaps is the Death. 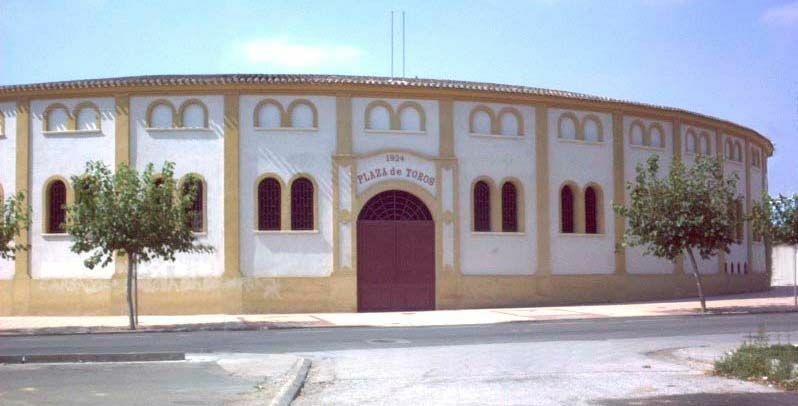 Juan Apiñani has a bullring in Calahorra, of recent building because it is located in a new area of the city; only fifteen years of existence, but very crowded because of being an attractive and cozy space of neighbourhood where kids play among the presence of older who filled the ring to the arrival of good weather. The continuous activity of the youngest parish of Calahorra, located in the basement of one of its sides, increases the vitality that, because of its strategic location, already have. Since 2004 the Bullfighting Club of Calahorra, which celebrates in November of the present year their golden anniversary, awards a prize to the best bullfighting time during the fair in August, which bears the name of Juan Apiñani. Made in bronze, represents Goya’s engraving characters, bull and bullfighter with pole on a pedestal. The winner of the Juan Apiñani trophy in its first edition was the prestigious rejoneador (mounted bullfighter with lance) from Navarra Pablo Hermoso de Mendoza. It is noteworthy that the City Council has not given the name of so illustrious calagurritano to the bullring of Calahorra. Even to the present one, dating back to 1924. It is called La Planilla, because of being located in a district with the same name, located not far from the football field and the municipal cemetery. Even so, draws attention, further, that no Town Hall Administration has decided to change it since then. Be a figure of bullfighting at the time of the Enlightenment and have been honoured to be immortalized by Goya in one of his most ingenious prints and emblematic images does not seem enough for the bullring of the town where he was born to get his name. Something had to see in Apiñani the universal genius to leave record of his bullfighting world, and so continues watching the passage of the time to reveal him as one of the icons of all his work. Bachelor Painter of Fine Arts from the University of Barcelona. Goya no solo dominaba magistralmente la luz y la sombra, tenía un perfecto estilo y técnica de la geometría y la perspectiva, ambos elementos manifestados en el buen toreo. Image and idea. Art and feeling.